What happens when you want a convenient solution for your unique air conditioning needs at home? Well introducing the best Vornado air circulators as the best place for you to start. In particular, we will be going in depth with the Vornado 660 and 733 models. There are various factors to consider when it comes to choosing the ideal air circulator for your needs. This is especially during the warm summer months when high temperatures are sometimes unbearable. For instance, the brand, capacity, power consumption, design, noise and more. We considered all these and more when preparing these best Vornado air circulator reviews. Averaging at slightly above $100, the Vornado 660 air circulator fan is a powerful machine that provides offers solid affordability and impressive performance. This makes it affordable for home purposes especially since this affordable than owning an air conditioner. Additionally, this price is also accommodated with a good warrant for added convenience. 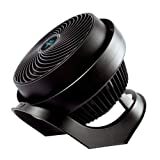 The Vornado 660 has dimensions that average at 15×13.5. x11.5. As a result, this machine has been designed to leave a small footprint on your property. This is just the standard size of most air circulators that are available on the consumer market. It also weights an average of 7.3 lbs. As a result, it is simple to transport around the house and a portable solution for your air conditioning needs. This when compared to most air circulators that average at 10lbs thereby making it a reasonable addition. This machine has a sleek and contemporary design which provides various benefits. For instance, this unique design helps to provide reliable power and optimal stability. Additionally, this design makes it a worthwhile addition to your interior décor. It also has a vortex design which is customized for air circulation purposes. The speed settings are as many as 4 and can be customized to suit various air condition applications. The speed control feature comprises of a unique dial which makes it simple for users to customize. This Vornado fan is also reasonable when it comes to power consumption. It consumes an average of 32 watts of power, and this makes it perfect for affordable power benefits. This makes it perfect for use in most urban setting and without any increased power bills. The fan also has four-speed settings, which make it ideal for use for power consumption purposes. You can customize the speed to match your air circulation needs. The speeds increase gradually from one to four, with four being the highest speed. Just turn the dial and experience improved air circulator performance. This machine is also silent in operation that the conventional air circulators that are available out there. In fact, it is silent enough to be used during sleep time and for various applications. The fans have been customized to be silent when passing through the air even in the high-speed settings. Chrome Glide Bar- The inclusion of the unique chrome glide bar allows users to perform a full 90-degree tilt. The 660 fluidly tilts in between different airflow positions along the chrome glide bar. Special Air Inlet- This device raises the bar with a specially sized inlet that can be used to direct the flow of air to different sections of the blade. Push Button Controls- It also has reliable push-button controls found on the top of the machine which allows for convenient selection. With its heavily contoured blades, this fan optimizes the amount of air that flows with each turn of the motor. This machine also comes with an exceptional five-year warranty for convenience. The warrant is valid as long as you don’t tamper with the device. The warrant is very reasonable, especially when compared to the affordable prices. Most products in this category often have an average of 2 years warranty. On average this air circulator has received exceptional reviews. For instance, it has received as much as 71% of 5-star reviews, 15% four stars, 5 % for three stars, 4% for two stars, and 5% for 1 star. Most of the users like the sleek and appealing design of the fan. It has unique lines and sleek matte finish to make an appealing addition to any interior. Also, they also like the simple and straightforward design. Most users also like that its highly portable and its unique design provides exceptional air circulation performance. 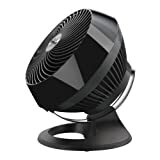 The Vornado 733 air circulator averages at 89$. Which indicates the price is lower than the Vornado 660, though this model does not have any notable upswings in functionality. Moreover, It provides a slightly higher air circulation power level than the 733. This makes it a reasonable and the best investment for air circulation purposes. This machine has dimensions that average at 16.2 x 14.2 x 15.2 inches. As a result, this makes it compact enough for your air circulation needs. This is the standard size accepted by most people for air circulators. It’s neither too big nor small thereby making it ideal for small and large spaces. Similar to the 660, the 733 comes with a unique vortex design. This makes it perfect for air circulation purposes. In addition to this, this fan also has an appealing finish is ideal for any interior décor. It also has sleek lines and u unique matte finish that is resistant to stains. Similar to the 660, this machine also comes with a normal 120watt/ 60hz power capacity which makes it perfect for use in almost any country. This exceptional power capacity means that this device is dynamic enough and reliable for your needs. It also has the same features as the 660 Vornado machine. The unique speed setting options are as many as three levels, which means that you customize the machine with just the twist of a dial. That said, three speed levels are somewhat low for some users who prefer 4. The power consumption of the machine averages at 38 watts, which is slightly higher than the 660 version. As a result, this machine is also perfect for those who want a powerful and practical machine for air conditioning purposes. This Vornado air circulator is not only powerful in operation, but it also produces a small amount of noise as well. As a result, you can easily use it during sleep time or when watching TV without struggling to listen. Thanks to the innovative design of the blades which provide optimal performance. Compact Design- Experience the superior quality of the Vornado 733B powerful air circulator which has also been designed to provide space saving benefits. Vortex Action- It comes with a unique vortex air circulation feature, which creates a swirling and deep penetrating currents of air. These work to rejuvenate and enhance the flow of air in the room. Three Different Base Positions- This fan is also designed to circulate air from as many as three different base positions. The inclusion of the three-speed control that is found on the back, allows for easy access and convenient speed selection benefits. You can use the 733B all year to provide reliable air supply performance. Simple to Use Dial- This machine also comes with a dial that makes it simple to customize the speed features. It is conveniently located on the side of 733 for convenient access. Classic Design and Elegant Color- With its classic design and elegant color, this machine blends well with almost any type of interior décor. It is also durable and stain resistant as well. Similar to its counterpart, the 733 is also available with an excellent warranty that averages at 5 years. This means that you can experience easily repair the unit should it be prone to damage. In addition, the warrant covers any defaults as long as the machine does not tamper. This machine has received several exceptional reviews from users. Most love the vortex design which provides a powerful air supply regardless of the weather conditions. Also, it is also durable and with an appealing finish to complement your interior décor. In particular, 72% gave it 5 stars, 9% 4-stars, 7% 3 stars 9% 2 stars 6% 1 stars. This clearly shows this machine is perfect for your needs. Broadly speaking, these two machines have both been designed to provide solid performance and impressive affordability. Although the 733 version might be more powerful than its counterpart the 660, both machines are perfect for your air circulation needs. Both devices have practical and fully functional designs. The 733 is much larger than the 660, though both provide similar performance benefits. The 660 is, therefore, a much better option for anyone who wants a compact machine that provides optimal air circulation. The Vornado 733 is larger, though it does not provide any significant edge over the 660 version. All things considered, both these machines have been designed to provide unrivaled performance. That said Vornado 660 has been designed to provide a better performance level than its counterpart. The 733 might be larger and with a higher air capacity, but the 660 is much more reasonable. It is smaller in size, and it provides almost the same performance benefits as its counterpart. The added benefit is that it’s slightly cheaper and with improved air circulation capabilities. Generally, when it comes to the Vornado 660 vs. 733 reviews, the 660 is a much better investment for your needs.